This post has been contributed by Alicia Fontaine, Volunteer Coordinator with the Stanley Park Ecology Society (“SPES”). I have been following SPES since I moved into the West End over a decade ago and I have been a member for four years. I wanted to offer the team an opportunity to share their news, events, and work so I have created “SPES Saturday” where they contribute and share stories with my audience once a month. A brilliant yellow verge rims sections of Lost lagoon at this time of year. Much to the delight of Park visitors, the yellow flag iris is blooming. But for Stanley Park Ecology Society (SPES), the blooming season is a call to arms. The BC government and the Invasive Species Council of BC have proclaimed May 2016 as “Invasive Species Action Month” to help raise awareness of the environmental and economic damage that invasive plants and animals can cause. When a non-native, invasive species is introduced into an ecosystem, it can spread rapidly, out-compete native species, and compromise natural habitats and processes that native species depend on for survival. 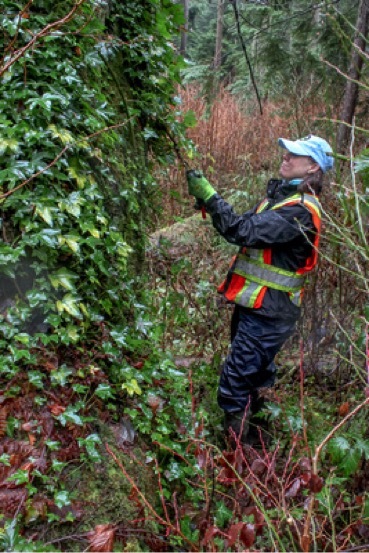 English ivy, a prolific invasive plant within Stanley Park, can kill a native tree within 15 years. In BC, just six invasive plant species caused an estimated combined damage of at least $65 million in 2008, with that amount expected to double by 2020. In Stanley Park alone, there are 72 non-native, invasive plant species, which are consuming about 30% of the Park. Volunteers who participate in Eco Stewards, Special Invasive Removal Team, Ceperley Creek Restoration, and Lost Lagoon Island Restoration, all have a substantial impact on offsetting the destruction of invasive plant species. In the past 12 months, 1,605 SPES volunteers have removed invasive plant species from 16,650m2 of land in the Park. Once the invasive species are removed, volunteers replant the area with native species, which prevents erosion and produces a high quality habitat. Some of these invasives, including the yellow flag iris, are being investigated for their “upcycling” value. Rather than transport the piles of green waste generated by invasive species removal to a composting facility, SPES and environmental artist Sharon Kallis are testing the “weave-ability” of various invasive plants’ fibres. So far, English ivy has been successfully crocheted into “bionets” which are laid across eroded slopes in the Park. The nets secure fresh native plantings that help stabilize the bare slopes and create habitat for wildlife. And Himalayan blackberry has been woven into wattle fences to protect sensitive rehabilitated sites. SPES and Sharon are drying the leaves of yellow flag iris and will soon be weaving them into various forms that could be used to support wildlife habitat in the Park. Nesting baskets for wrens, perhaps? If you would like to help remove invasive plant species in the Park, consider joining SPES’ next Eco Stewards events: Saturday, May 22 or Saturday, June 11. 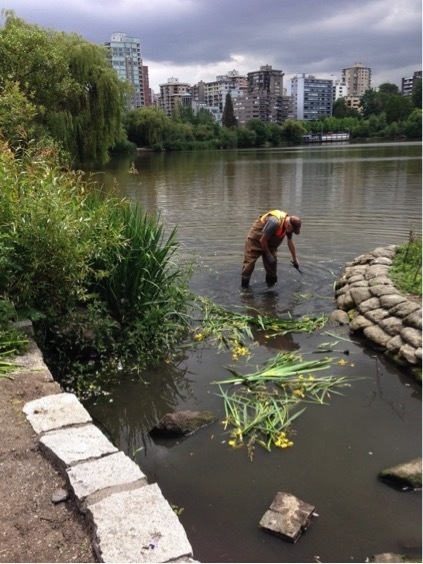 For those keen to be a part of SPES’ Special Invasives Removal Team, email the Stewardship Coordinator or call 604-718-6547. This post has been contributed by Alicia Fontaine, Volunteer Coordinator with the Stanley Park Ecology Society. If you want to support a non-profit organization that makes a difference for wildlife and people in Stanley Park, please make a donation or become a member of SPES. For more information visit the Stanley Park Ecology Society website.